Srinagar, Feb 8: The Srinagar-Jammu national highway, the only all weather road connecting the Kashmir valley with the rest of the country, remained closed for the third day on Friday due to heavy snowfall, landslides and shooting stone, a traffic police official said. Meanwhile, a massive rescue operation was going on at Jawahar tunnel, where ten people, including eight personnel of Jammu and Kashmir police, were buried under a huge snow avalanche, also blocking one of the two tubes of tunnel. 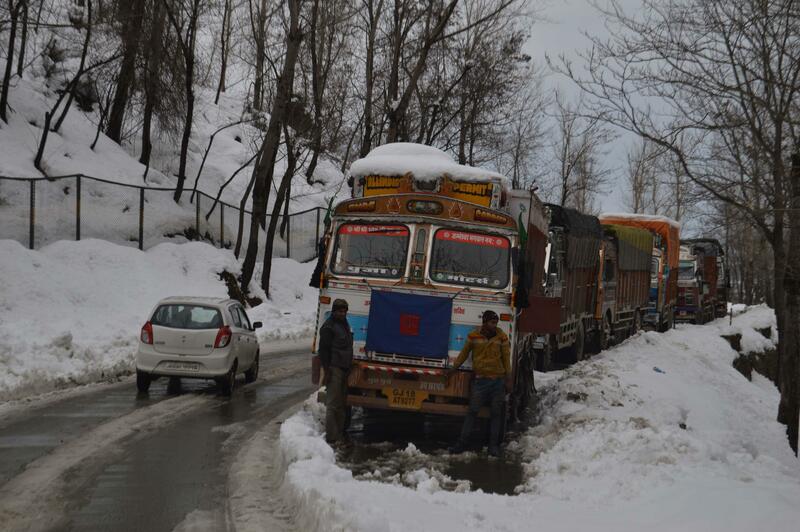 Though weather has improved, traffic could not be restored on the Srinagar-Jammu national highway due to accumulation of snow on both sides of Jawahar tunnel, Banihal, Qazigund and Shaitain Nallah while frequent landslides and shooting stones also continued between Ramban and Ramsu stretch, traffic police official told TNN this morning. He said the National Highway Authority of India (NHAI) and Border Roads Organisation (BRO) are responsible for the maintenance of the highway and are working round the clock to make highway traffic worthy. However, he said, frequent landslides and shooting stones, particularly at Penthal, Anokhi Fall and Battery Cheshma are badly hampering the operation. One person was critically wounded when a stone hit him at Anokhi Fall, he said. A huge snow avalanche on this side of the Jawar Tunnel washed away a shed, where eight police personnel and two others were staying on Thursday. Snow avalanche has also blocked one of the two tubes of the tunnel, he said adding continued snowfall besides strong winds hampered rescue operation last night. However, this morning the weather has improved and a massive rescue operation has been launched to trace the missing policemen and two others, he said adding so far there was no success. The NHAI and BRO have also launched snow clearance operation on the highway, including both sides of tunnel, he said adding efforts are being made to remove the avalanche near the tunnel. He said, even after the snow is cleared, traffic would not be allowed until falling of landslides and shooting stones stops. Allowing traffic when there is always danger of landslides and shooting stones, will be risky, he said. Official sources said large number of vehicles, including those carrying passengers, are stranded on the highway for the past about a week. The national highway, connecting Ladakh region with Kashmir also remained closed since December last year. There was fresh snowfall on the highway, particularly between Sonamarg-Zojila pass-Zero point-Meenmarg, which was already under several feet of snow. Fresh snowfall was also received on historic 86-km-long Shopian in south Kashmir and Rajouri and Poonch in Jammu region. The road is also closed since December last year due to accumulation of several feet snow and slippery road conditions. The Anantnag-Kishtwar road also remained closed for the past over two months.